On the BA Fine Art degree you will develop the clarity of thought to recognise creative opportunities, and the confidence and skills to take them forward. You will become part of a close-knit community of artists, supported by inspiring tutors who are committed to helping students achieve their creative goals. They will encourage you to move between and beyond painting, printmaking, sculpture and new media, making the most of our purpose-built studio spaces and superb facilities. A unique feature of the course is Shared Drive, which twice a year brings together all Fine Art students from all three year-groups to work on ambitious collaborative projects. Working as part of a collective will help you to discover new strengths and develop your professional abilities, such as the negotiation of ideas, project-planning, management and leadership. Career-focused option modules, talks by visiting artists, and study visits to exhibitions in London and elsewhere will help you prepare for your future. Based within a Russell Group university, the course also invites contributions from researchers in other disciplines, such as demography, archaeology and the life-sciences, to spark creative responses to global issues. Art is the transformation of objects and materials, broadly defined, at the service of an idea, without precondition. Our Fine Art programme is focused on contemporary manifestations of such transformation: the here and the now and the future, a preparation for the cutting edge. It introduces the concepts, techniques and methods through which you will engage with the breadth of current art practice, develop criticality and reflection, and learn the independent application of skills. This is a three-year, full-time undergraduate degree. Each year is divided into two semesters, with one studio practice module and one written module per semester. In addition, students from across the three years come together to participate in two collective Shared Drive projects each year. First-year studio practice modules are an opportunity to explore ideas and experiment with materials through a series of assignments, themed at first and then self-directed. Regular workshops give you the chance to learn a wide range of skills and techniques, such as screen-printing, digital photography, and video-editing, and the making and use of armatures. We will encourage you to blend skills and techniques and to think ambitiously within practical constraints. In the second and third years you will have the freedom to pursue your own ideas and develop a distinctive creative voice. While this might be characterised by a particular medium or technique, it could equally take the form of a strategic approach that defines your work across a range or combination of media – you will be encouraged to think beyond the traditional disciplinary boundaries. As you go into the third year, your studio time will be devoted to focusing your ideas in preparation for the end-of-year show. Our Fine Art degree shows have a reputation for ambitious and challenging projects that attract broad public interest. Conversion of our studios into a large display space provides a platform from which you can launch your career with confidence. Alongside your studio practice you will take a written module each semester, including a career-oriented option module in Year 2. Written modules are designed to develop your research, critical and analytical capabilities, provide context for your practice and equip you with essential professional skills. explore art history and its connection to current and future practice, and engage with contemporary concepts and debates. focus on professionalism and understand how to present yourself as a distinctive practitioner when you graduate. develop your editorial and curatorial skills in relation to your own work – for example deciding what to display and understanding the power of juxtaposition to articulate meaning. critically evaluate your final project in the context of other practitioners’ work and the cultural factors that have influenced you, identifying points of reference and articulating the relationships between them. try new creative and documentary techniques – as well as making the piece itself, students document it through photography, video and drawing, and explore it through performance pieces. experience the creation of a large-scale work, from planning to completion and public exhibition. get involved in decisions about the display of the work itself and the accompanying documentary material. gain essential transferable skills, such as planning, project management, the negotiation of ideas, problem-solving, group-work and leadership, that are invaluable for artists working individually and for other career paths. quickly get to know the School’s Fine Art community by working with students from all years from day one of the programme. A life-size recreation of the raft from Géricault’s painting The Raft of the Medusa, with accompanying projection and performance pieces. A remaking of Robert Smithson’s Partially Buried Woodshed. Smithson’s piece, made at the beginning of the American Land Art movement of the 1970s, became a metaphor for the turning of popular opinion against the Vietnam War – this was explored through performance and sound pieces. A re-enactment of Neil Armstrong’s first steps on the moon. A stunt-coordinator was hired to help create low-gravity conditions for the student-astronaut’s walk, and the event was broadcast live to our own Mission Control. We arrange gallery visits, taking advantage of the School’s proximity to London. There are also the opportunity to organise exhibitions of your own work throughout the year, on and off campus. We organise overseas study trip, which in recent years has seen our students take part in the Transmediale digital media festival in Berlin. You will be able to attend the weekly Talking Heads lecture series, at which visiting artists talk about their work. We take advantage of our position within a Russell Group research-intensive university by drawing inspiration from research in other disciplines. One example is a project that used the challenges of the growing global population as a prompt for creative responses, with speakers from other disciplines explaining demographic statistics and related issues of food security, energy, migration, employment and health. You will learn from academics who bring their own research specialisms, and their experience as arts practitioners, to the course. Programme leader Dr John Gillett is an experienced curator of contemporary art exhibitions and a digital video artist, publication designer and writer. His specialist interests include issues of audience engagement and the interpretation of art for the viewer. He has collaborated with psychologists at the University’s Centre for Visual Cognition to improve understanding of compositional aspects of contemporary and historical paintings. Ian Dawson is a sculptor whose work combines many materials and processes, including collage and 3D printing. He has exhibited in New York, Los Angeles, Paris and Berlin. He has an ongoing collaboration with the University’s Archaeology department. His recent book, Making Contemporary Sculpture, investigates the studio practice of some of the most exciting sculptors of his generation, including Keith Tyson, Fiona Banner, and Gavin Turk. Gordon Hon is a theorist, writer and cultural observer with a background in painting and video. His research interests cover the political applications of contemporary art, particularly with reference to nationalism, identity and globalization. Mia Taylor’s work involves the use of advanced technology such as laser cutters to explore the limits of two-dimensionality and surface. She is interested in space, spacecraft and satellites, and has organised an initiative to engage students with the CubeSat project run by the University’s Astronautics Research Group. Nicola Thomas is a practising artist with a broad and current knowledge of contemporary art. Her own practice includes printmaking, video and spontaneous performance. She has shown her films in Paris, Berlin and Miami, and her prints are included in special print collections at the Victoria and Albert Museum and Royal College of Art. Join a supportive, creative community in which you can experiment, explore and collaborate. We guide you in the development of an artistic practice that is conceptually distinctive, technically accomplished, and underpinned by an understanding of its historical and theoretical context. Realise your creative ideas through a combination of media, taking advantage of our cutting-edge facilities and superb studio space. Includes a unique, collaborative learning approach that involves working with students from all year groups on ambitious, large-scale projects. A high level of personalisation – the focus is on your own creative practice throughout: occupy your own studio space; choose second- and third-year spaces that suit your practice, and an optional module that interests you. Benefit from study visits to exhibitions in London galleries and elsewhere. The option in your second year of an Exchange module with one of our overseas partner-institutions. Launch your career with a final major project at the end-of-year show. Winchester School of Art ranks 8th in the UK for art courses (Guardian University Guide, 2017). Other qualifications will be considered on an individual basis. Applications should be made via UCAS. Applicants who meet our minimum entry requirements will be invited to attend an individual portfolio interview. We will conduct portfolio interviews from December onwards. Equal consideration deadline: 15 January. Early applications are welcomed. Year 2 entry: if you have professional experience, or credit through prior learning at another institution, you may be eligible to use this experience against some of the programme requirements for period of study. You will need to present evidence that you have met the learning outcomes of the programme. Full details can be found in the University’s Policy on the Recognition of Prior Learning. International and EU students must also comply with the University of Southampton's English language entry requirement for this course, which is to achieve IELTS 6.0 overall with a minimum of 5.5 in each component, or equivalent. Please see English language entry requirements for further details of English tests that we accept. If you don’t meet our English language entry requirements for direct entry onto any of our BA programmes, you could be eligible to study on one of the University’s English language pre-sessional programmes at the Centre for Language Studies. 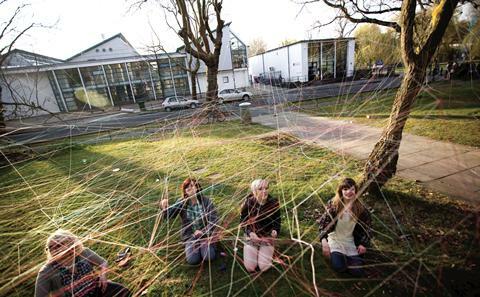 For more information please visit Winchester School of Art Undergraduate Pre-sessional Programmes. You will study a range of compulsory and optional modules. The Exploring the Discipline module outlines the nature of contemporary art and the relationship between historical antecedents and current practices. It highlights the need for critical evaluation of the work of others and approaches to it, and the role of reflection in creative practice. It covers ethical considerations and introduces a range of study skills. Throughout Part 1, through workshop inductions, you will be introduced to a range of practical skills and media. The Studio Practice 1A (Materials and Techniques) module is designed to give you an early practical grasp of the scope and possibilities of contemporary fine art, the use of materials and techniques in the development of ideas, and the role of intellectual engagement in creative practice. Studio Practice 1B (Research and Skills) adds to the range of materials and techniques with which you are familiar, introduce the role of contextual research in creative practice, and prepares you for the direction of your own practical work in Part 2. Contemporary Issues provides skills necessary for the critical development of well-informed contemporary art. It explores how practice is informed by context and theory. You will be offered guidance on your selection of a studio for Part 2 and your choice of career-orientated Optional Core module. Studio Practice 2A (Experimentation and Reflection) encourages further experimentation; to continue the development of your technical knowledge, raise the level of your research and critical reflection, and enable you to start to define the particular nature of your own practice. Studio Practice 2B (Focus and Ambition) seeks sharper focus, greater ambition, and articulation of a well-defined critical context for your practice. This context is explored in detail via the Framing your Practice module which enables you to look outwards from your developing studio practice to consider critically and analytically your own selection of other relevant cultural or creative outputs and to reflect on how they bear upon the direction of your work. Part 2 also includes your career-oriented Optional Core module and the opportunity to apply to study abroad for the second semester, on the Study Exchange for Fine Art module. As part of your studies in Part 2, Semester 1, you will be able to select one of six optional core modules, each designed to provide you with an opportunity to broaden your studies and engage with peers from other art and design subjects in an interdisciplinary environment. The Exchange module is based on exchange agreements with institutions in the EU established under the Socrates-Erasmus Exchange study programme and bilateral exchange agreements in Canada and elsewhere. You will need to be able to articulate why you wish to travel abroad as part of your study and what you are seeking to achieve. Whilst on exchange you will have input from academics and professionals at the host institution. You will be expected to work to the schedule and standards prevailing in your host institution. The work you do abroad will be equivalent to that undertaken by fellow students remaining in the UK and will be assessed, on your return, against the criteria used at WSA. In addition to the work you do on the Exchange module, you will be required to complete the assignment for the Framing your Practice module, for which you will receive guidance in advance of your departure and via Blackboard and email. Your Student Exchange will be supported by a programme Exchange Coordinator and a dedicated handbook. Studio Practice 3A (Organisation and Connection) looks for continued experimentation within an increasingly defined practice which is starting to yield ambitious, professionally organised and audience-oriented outcomes. In 3B, the Final Major Project (Fine Art), you will bring together your practical learning in a single, self-directed, fully-resolved exhibition outcome which is well-presented and articulated. The Project Development Essay module paves the way for this through the identification of key points of reference and focused critical reflection which inform a conceptual framework for the project. Semester 1 of Part 3 also includes Professional Engagement, a module which prepares you for professional practice and employment beyond the Programme. Stationery You will be expected to provide your own day-to-day stationery items, e.g. pens, pencils, notebooks, etc). Equipment Art equipment and materials: Drawing paper, painting materials, sketchbooks, tools Some generic materials are available within the School, and a limited number of basic hand tools. Power tools and specialist equipment are provided and available for use following appropriate induction and training, and according to relevant booking procedures. All other materials required for individual studio practice must be sourced by students at their own expense. Placements Industry placements and study exchanges: These cost for accommodation, insurance and travel costs etc. will be dependent upon the destination and other variables. Career-focused modules, talks by practising artists, and the development of specific and transferable skills will prepare you for a career as an arts practitioner. Our graduates are self-motivated, flexible, highly creative individuals who go on to succeed in fine art and in a diverse range of fields including the film and music industries, publishing, and museums and galleries. You will learn through lectures, seminars and practical workshops, and through the Shared Drive projects, exploring concepts and techniques that will inform your own studio practice. Guest lectures and study visits offer additional opportunities to hear from practitioners and develop your understanding of the wider art world. You will also learn from your peers and develop your own critical skills through weekly group critiques, where students take turns to present their work for discussion. This is an invaluable opportunity to hear others’ responses to your work and explore possibilities for its development. At the end of each semester you will present your studio work for assessment. The written modules include essays that demonstrate your ability to contextualise your practice. Our modern, purpose-built studios and facilities are second to none. First-year students have their own studio space, and in the second and third years you will choose between studios with an emphasis on painting, printmaking, sculpture and new media. Your choice of space does not limit your creative opportunities – you will have access to all types of media, workshops and facilities throughout the programme. We have comprehensive facilities for painting, sculpture and printmaking, with foundry, kilns and a sculpture yard. You will also have access to the School’s extensive resources in new media, photography, digital printing, time-based media and computing, with expert technical training to help you get the best from them. The School also has a superb library with a dedicated collection of artists' books and a wide range of materials to inform your critical and contextual studies. The BA Fine Art has a relatively small intake and taking part in participative, cross-year projects from the very start of the course will help you to settle in and get to know your fellow students. It is a supportive environment with regular opportunities, formal and informal, to ask questions and receive feedback on your work from your tutors and peers. In addition, you will have a personal academic tutor who can advise on any programme-related queries you may have or help you access the wide range of University and Students’ Union support services should you need them.